A learning agenda is a strategic approach for building an evidence base to inform decision making. 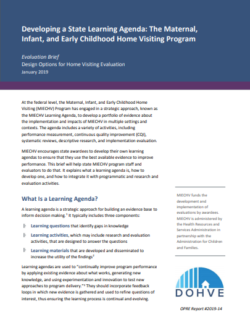 At the federal level, the Maternal, Infant, and Early Childhood Home Visiting (MIECHV) Program has engaged in a learning agenda to develop a portfolio of evidence about the implementation and impacts of MIECHV in multiple settings and contexts. The agenda includes a variety of activities, including performance measurement, continuous quality improvement, systematic reviews, descriptive research, and implementation evaluation. MIECHV encourages state awardees to develop their own learning agendas to ensure that they use the best available evidence to improve performance. This brief will help state MIECHV program staff and evaluators develop their own learning agendas to ensure that they use the best available evidence to improve performance. It explains what a learning agenda is, how to develop one, and how to integrate it with programmatic and research and evaluation activities.